But now, because of their negligence you are in pain, need medical attention and probably cannot use your vehicle because it’s damaged. And to make it even worse, you probably have insurance companies calling you to get you to make statements and sign off on papers that you have no idea what you're really signing. And could possibly be signing away your rights to receiving any type of compensation for your injuries and to have your car fixed or replaced. Believe me, the insurance company of the person who caused you injury have an army of lawyers at their disposal to do battle. They know that people will just wave the white flag and surrender all of their rights and compensations that they are entitled to. If you have been in an accident don't be a victim, don't wave the white flag don't surrender. Let me help you. Let me do battle with their Legion of lawyers. Let me fight for you. And let me get you everything that you rightfully deserve and are entitled to. This is what I do each and everyday of my life. I protect the rights of innocent people like you. All you have to do is pick up the phone and call me now at 267-422-2988. It doesn't cost you anything to talk with me. That's right.I will give you a totally free consultation. You give me nothing for this consultation. And if I can help you I will tell you that. And if I cannot help you, I will tell you that as well. But I may be able to refer you to someone else who can help you. So either way it's totally worth it for you to call me and chat with me now at 267-422-2988. People like you, my accident and injury clients do not pay me a thing unless I have been able to recover financial compensation for you. This means that I work on a contingency basis. And that means that I only get paid if you do. So you have absolutely nothing to lose. But you have everything to gain. So pick up the phone right now and call me at 267-422-2988. 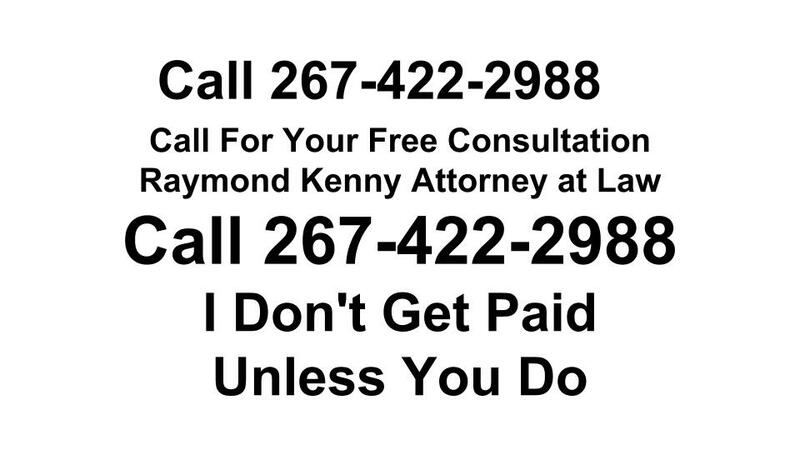 Raymond E. Kenny is a trial attorney who focuses on fighting for justice for his clients. Mr. Kenny aggressively represents those injured in car accidents, trucking accidents, bus accidents, motorcycle accidents, bicycle accidents, premises liability accidents, slip and falls, and general liability cases. He also handles Workers’ Compensation, Social Security Disability, Real Estate and Wills and Estates matters. Mr. Kenny was born and raised in South Philadelphia. He is a Central High School Graduate (245th Class). He then went to Temple University where he graduated with majors in both Real Estate and Finance. He then attended Widener University School of Law where he graduated (1995) with a Juris Doctor degree. He is no stranger to hard work. From elementary school, selling pizza at Lorenzo’s in the Italian Market, through law school, working as a law clerk at a law firm, Mr. Kenny has always worked hard. He paid for both his college and law school educations on his own. Mr. Kenny’s experience, in and out of the courtroom, have made him a well-rounded aggressive litigator who communicates with his clients, listens to what his clients have to say, sees things from his clients’ perspectives, and fights for what his clients want. He advises you of, protects, and fights for your rights. You have to ensure that you’re dealing with reputed lawyers who are specializing in personal injury cases. This is one way of ensuring that you get maximum compensation on your claims. You see, personal injury cases involve enormous financial loss, especially the extreme cases. By hiring a competent lawyer, you will surely get the appropriate compensation because the lawyer can ascertain your financial losses. If you’re dealing with insurance companies, your lawyer can also handle the tasks on your behalf. You will receive the needed advice as to how to properly file a lawsuit and how to complete the legal formalities that go along with it. When you file a lawsuit, you need to fill out certain forms and not only that, you also need to pay the required fees. With the lawyer around, you can easily accomplish the forms needed for litigation. You will have an effective guide while you’re still in the claiming process. Aside from the lawyer’s services mentioned, you can also be advised by your lawyer if your particular case is entitled to a claim or not. Because of today’s advanced technology, many law firms maintain various online sites to meet the needs of customers who seek legal help. Oftentimes, law firms don’t charge fees when giving legal advice, especially in California. By consulting a competent lawyer, the damages of the personal injury can be calculated and explained. The lawyer will also tell you the pieces of evidence that you need to prepare. Processing time these days are fast because lawyers usually work with insurance and law agencies. Many individuals can’t understand legal citing and terminologies but your lawyer can help you out. When you’ve finally chosen a competent and experienced lawyer, you will get the needed legal advice from litigation until the case is closed. All the courses of action that you need to take will be explained to you by your lawyer. You will have someone to depend on until you finally get your claims. So whether you’re in Philadelphia, PA or in any other city or state in the US, you can easily seek legal help in your local law firms or in online websites. You only have to choose between these two alternatives and after that, you can already choose a lawyer who specializes in personal injury cases. There are so many lawyers in the directory but if you want to narrow down your searches, you should look at the directory of personal injury lawyers. Compare their last case experiences and choose the most competent and reputable lawyer. It’s much better if you can find a personal injury lawyer in your locality because you can make the necessary appointment at your most convenient time. That way, you can already discuss the details of your case and the lawyer can already assess if the case is entitled to a claim. Seek legal help now especially if you’re a victim of personal injury. For every state, the family and divorce law differs although information that will be given in this section tackles majorly of what is present in every country and how it is dealt with in general. In order to seek a clearer vision regarding a particular topic, you can consult a divorce or family lawyer regarding your status of getting professional advice. Family is one of the most important units within the society that gives meaning to life. However, when balance is moved, there are matters that needs to be discussed and people who are seeking for advice can be given certain ideas on how the law that governs the family works, some of which are about the totality of marriage, divorce, child custody and child support. Laws regarding marriage status in the United States are strictly governed by the law of the state. However, there are federal regulations that rely on the marital status of the couple in order to determine the federal benefits and rights which invoke the important definition of marriage to the law. Furthermore, the constitution ensures that the United States Supreme Court will be able to review the laws which are related to marriage. Agreement on divorce is similar to agreement on separation, marital agreement, and agreement on the settlement of properties which are legally acceptable with the contract settling matters involved. It will not be referred to as an agreement on being divorced because only the court can grant such request. If both parties will fail in reaching the agreement, the case will undergo trial and the decision of the court will be altered. Whatever the court has raised can be modified and will be based on the change in substance and circumstance. Agreements, therefore, can be modifiable or non-modifiable. Generally, ordinances authorize courts of having responsibility or jurisdiction of proceedings regarding divorce in order to determine who should have the children’s custody under the marriage. Within the common provision, parents of a child who is legitimate are considered as joint guardians of the child and each parent’s rights are equal which means that each parent has the right for the child’s custody the moment they separate. And because of the controversial authority to decide custody based on the court’s jurisdiction, laws within this field are based on the state. In cases where there is judgment for dissolution, separation, or annulment, the court usually orders that both parents should pay the amount necessary for the child to be supported until proclaimed stable or when the child reached age of independency. Financial support of the child will be based on the facts of the couple’s separate cases. The court has the right to consider that both parents are responsible and obliged for supporting the child. Considerations will be made upon establishment of the amount that should be supported and it will be given to both parents which, under the legal help, should provide proper support and proper welfare for the minor including the child’s needs. Mails coming from different parts of the country, credit companies crowding your door. You feel like every creditor is hassling and harassing you from every corner of your life. You are broke and got no where to turn to. Whenever you consider the idea for filing for a bankruptcy status, it seems to be impossible. But think about this – there is still hope for this kind of predicament. If you are experiencing this kind of situation, you can do things to ease up your burden. With all of these, you are not alone. Unfortunately, the recent change in the way bankruptcy should be dealt is tough knowing that when you ask for help, you are bound to pay what you don’t have. Do not fret. There are other ways wherein you can still afford getting legal help for a bankruptcy status. Below are the different important steps for finding legal aid for a bankruptcy situation. 1. Confer with a counselor with expertise on credit. These types of professionals are equipped to help you to be able to control your debt even without filing any bankruptcy claim. Luckily, a majority of these people offer their consultations for free. 2. Legal fees must be included in your case of bankruptcy. If you are planning to file Chapter 13 on bankruptcy, you have the option to pay your solicitor or attorney his fee the way you are paying your entire bills. In some situations, you can have the opportunity to cease paying bills like credit cards so that you can prioritize paying your lawyer or attorney. 3. Whenever there are offers for free consultation, take advantage of the chance. Events like these are common among lawyers and it’s more beneficial on your part to ensure that the solicitor or lawyer is the person whom you can trust and put your bankruptcy situation in process. 4. Pro bono lawyers are also one of the most important considerations that you have to take advantage of. This is a perfect opportunity although these lawyers are not always present to appeal to your case or represent you. Some attorney will help you and work for you with a minimal or reduced fee but not totally for free. Matters like these are important to ask when you are engaged in a free consultation. It will give you a wider view on what to expect and what not to expect when it comes to lawyer guarantee service of your status. 5. Limited representations must always be considered. These kinds of options are not available in all states of America but your state may have it. The irony with this is that, when the responsibilities of your attorney are limited, you expect that the bill you have to pay them is also less. On the other hand, you have to make it clear that even if the sum isn’t that great, the case is handled carefully and with ease. Remember that any kind of error within the process of handling can result to dismissal of your case and seeing your remaining money go down the drain. Worse, you have to pay them back again just to make sure that they win your case. Upon knowing the things above, you are to expect that a fee is always present in any kind of service that is why, when there are openings for free consultations for legal help, you have to grab the opportunity. If you’ve witnessed divorce proceedings, then you probably know that it’s drawn out and very expensive. Divorce cases are not new in today’s modern times. Couples are now more open to this alternative if their marriage doesn’t work out. Once the couple decides to file for divorce, they should seek advice from the right organizations and legal firms. If the couple doesn’t want to spend too much on the divorce proceedings, they should consult free legal help for divorce. Not all couples can afford the expensive cost of legal help. Those with limited resources can easily look for free divorce legal help online. There are non-profit organizations that provide free divorce legal help and they usually have their own websites. These organizations have experienced and very competent divorce lawyers who extend free legal help. Aside from the non-profit organizations, there are also reputed attorneys and legal firms who offer pro bono social services. These lawyers or attorneys take some divorce cases each year without asking for any fees. If you watch TV all the time, you can look for live shows and chat shows about divorce, legal advice, and issues. Some radios also have programs about legal help for divorce. If you want to obtain free and sound legal advice, you can write to TV shows or radio programs. This is a good way of consulting the experts because you will surely get enough information and advice. Among the new concepts online are online divorce and its gaining popularity these days. In fact, many couples have tried it already and they were able to deal with their divorce proceedings in a timely and simple manner. If you want you can also try ‘pro se waiver’. This option is almost free because you need to pay a small fee to get legal services throughout the divorce proceedings. This is already a packaged deal and so couples don’t need to worry about costs every time their lawyer sits in the courtroom; not only that, this option also saves time and energy. Start looking for this legal option now and you will only fill out some forms and pay nominal processing fees. Soon the divorce proceedings will be over and you can already begin a new life. Some say that there is a huge difference between paid services and free legal services. For those who can afford paid legal divorce services, start looking for the best legal services in your area so that you can get over the divorce proceedings soon. People with limited resources can stick to the free legal services offered by non-profit organizations or pro bono services but make sure that you choose carefully. When looking for a divorce lawyer, you need to ensure that your lawyer is looking after your best interests. You have to conduct some background checks to see how many divorce cases your lawyer handled in the past and to determine his or her creditability. You must be able to trust your lawyer all throughout the divorce proceedings to ensure success. If the couples are in good terms, they can seek legal help together. So if you and your spouse decided to file for divorce, get legal help at once. Don’t be left helpless and ignorant. You need to know the law to protect your own interests and you need your lawyer to guide all your actions. After considering the factors, you now have to hire a staff attorney for the facilitation of your business. If you have a lawyer that is dedicated on your side and is considered as a vital member of your company, then you are to expect a reasonable and the best effort more than what money can hire. As the company’s lawyer, he is tasked to give more intimate information regarding the status of your company’s transactions and therefore, he will be able to carry your case with a degree of greater familiarity. If you have no permanent lawyer to back up your company’s claims, then it is now time to go online and find lawyer listings wherein the description states that the lawyer is a legal aid for audit of companies and any kind of business. You will find more than hundreds willing to render service just within your state or area. You must be aware that if you want to become a US green card holder, you will have to spend a lot of your money and time. Foreign citizens who want be a US citizen should be prepared for this and if you want to make the process a lot smoother, you should seek the necessary legal help. Because of the stringent policies in the US when it comes to acquiring green cards, many foreign citizens are illegally residing in many different states. According to some critics, the system being used by the US should be made simpler but since you’re the applicant for the green card, you should follow their rules. Before the green card was colored green but at present, it is already white colored with green printings; the card is valid for 10 years and a foreign citizen can get it when their employer or relative petitions them. By seeking the needed legal help, you will be able to go through with the various steps smoothly. Start looking for lawyers who are specializing in green card cases. Once you find a reputable lawyer, you can already follow the three steps. The USCIS (US Citizenship & Immigration Service) is the agency that issues green cards to foreign citizens. You will need to submit all the pertinent paperwork to this agency and their staff will review your papers. After that, the agency will determine if your papers will be approved or not. After the decision of the USCIS is given, the paperwork will be forwarded to NVC (National Visa Center). Your green card petition will need to wait until there is already an available visa number. Every year, limited visa numbers are released; so don’t expect for an immediate visa number. Once a visa number is given to your petition, it will be forwarded to the US embassy which is based in your home country. As you can see, the three steps may sound simple and easy but it’s not as simple as you think. There’ll be lots of paperwork and the whole process is quite time consuming. You have to devote a lot of your time in preparing the necessary paperwork and not only that, you will also spend a lot of money. If you want to prepare all the necessary paperwork without any problems, you should seek legal help. Find a reputable lawyer now who has past experiences in handling green card matters. Due to the extensive paperwork, you will need a guide all throughout the process. Private lawyers can cost a lot in the long run and you should be prepared for such expenses. However, if you have a personal lawyer, you can be sure that all the paperwork is accurate and there’ll be less room for mistakes. That way, the papers will be immediately processed in the concerned agency. Having complete and accurate paperwork will make it easier for the concerned agencies to process the green card petition. Hire a lawyer who knows a lot about green card petitions. You can ask referrals from friends and relatives or you can also do a quick search online for reputable and experienced lawyers in your area. This is one sure way of getting your green card petition approved in less time. Be prepared for everything. Very few people hear God’s call and for those who want to establish a new church, you should be aware that it involves strategic planning. Church leaders should be like entrepreneurs because they need to handle things like acquiring capital, attracting faithful church members and possible expansion activities in the future. This is where legal help comes in. Establishing a church is not an easy task. Have you already looked into incorporation, bylaws, marketing, and giving grants? These are some of the activities in putting up a church which involves some legal matter. It entails preparation of some legal forms and other pertinent paperwork. If you don’t know the needed forms and legal procedures, you will be at a loss. It is therefore essential to find a lawyer who knows a lot of about the legal matters of the church. You can conduct a local search or you can also search online. It would be an advantage if the lawyer or attorney resides in the local area because you can easily ask for an appointment. It will also be easier to make the consultations at any time because you can contact him or her immediately. However, if you can’t find a local lawyer who is good at handling legal matters of the church, you can conduct an online search. The internet provides a lot of information resources like lawyer listings. You should look into the appropriate listings so that you will find the best lawyer soon. During incorporation, the church will already be regarded as one of the legal entities. You need to prepare the various rules, regulations, and benefits for incorporation. If you have a lawyer, you will know what to do with the paperwork. It will be much easier to establish the rules or regulations with the aid of the lawyer. Not only that, you will be able to submit the accurate paperwork to the right agency in less time. Churches are tax exempted and so the lawyer can help you with that task as well. It should be reflected in the bylaws of the church. The bylaws of the church is regarded as the doctrinal statement and it hierarchs the duties, responsibilities, and obligations of the church. Marketing and grants are important concerns as well. Since the church is new, it should be advertised to the public. There are lots of ways to advertise the church and the lawyer can help you with establishing contacts. When giving grants, a proposal should still be drafted and again it will entail paperwork. With lots of paperwork to take care of, it will take a long time before you can accomplish them without a good lawyer. Hiring the best and the most knowledgeable lawyer who can handle legal matters of the church should be your primary objective. Once you find a reputable lawyer, your church will be put up vey soon. Follow God’s call and in order to achieve all the things you want, don’t forget to hire a lawyer to help you with all the legal matters and paperwork. Well of course, you’re expecting the Almighty to guide you in all your actions but with the aid of a lawyer, your efforts will not be wasted and you will surely follow the right path. Get a good lawyer now. Do you need legal help to know more about the family laws? According to the child support enforcement Act of 1984, custodial parents have the right to collect the needed child support from the ex-spouse. State and district attorneys can help the said custodial parents to serve the paper that orders the ex-spouse to arrange an appropriate payment schedule. If the ex-spouse does not follow, that individual can be imprisoned. In times when the ex-spouse’s location is unknown, authorities can help the custodial parent in locating him or her. Non-custodial parents who abandon their obligations are quite common these days. The federal law can intercept tax refunds in order to enforce child support. Aside from that, there are also other ways for enforcing child support from your ex-spouse like wage attachments, suspending occupational or business license, seizing property, and revoking the driver’s license. These methods can be used to locate the ex-spouse who refuses to provide child support. Many families can’t afford the expensive legal help and so they can seek assistance from free legal services. You can also sue your ex-spouse if he or she willfully refuses child support according to the CSRA (Child Support Recovery Act). If your ex-spouse can’t provide a reasonable explanation, he or she can be imprisoned. However, most states don’t resort to this option because the ex-spouse will be able to support the child one way or another when he or she is not in jail. The most important thing now is for the custodial parent to know more about the family law. Don’t be ignorant about the law because this is your ticket for getting the proper child support for your child or children. This matter can’t be handled without legal help so you need to consult the right organizations and attorneys. Again, there are free legal services out there for those who can’t afford to pay for private services. Take advantage of the free services now so that you can oblige your ex-spouse to support your child/children. Perhaps the only way to enforce child support is by legal means; so don’t waste time by doing nothing. You have to act now because you have your rights and your kids as well. There are also legal self help services online that you can check out. You might be able to find useful information resources that can be of good use to you and your family. You and your kids have gone through a difficult time, and perhaps your ex-spouse as well; but that doesn’t mean that you can’t enforce him or her to provide child support. Divorce is quite costly and you will spend thousands of money for attorney fees and divorce proceedings. You have to hire an attorney who specializes in divorce matters. Husbands have different needs and they usually have to deal with a lot of financial strain aside from paying attorney’s fees. During divorce proceedings, husbands need to deal with alimony. The husband must be protected and a fair alimony calculation should be made. The problem is much worse if the couple has kids. In this case, custody issues arise and it needs to be settled as well. The husband must get a lawyer who specializes in handling the men in divorce cases. You can consult with ADAM (American Divorce Association for Men) because this is the organization that focuses mainly on the needs of the husband during divorce. By consulting the organization, the husband will know of his rights and other matters like alimony, child support, child custody, and other important matters. The attorneys usually discuss all the legal matters with the husband and wife and they also offer various legal options. The couple will be given counseling especially when the divorce proceedings are still being carried out. Oftentimes, men want to secure their financial future and so they need experienced divorce attorneys. Family finances are usually examined by the court handling the case and it will be divided accordingly. Aside from the legal services, attorneys can also provide husbands with parenting plans so that he can still have a good relationship with his children. Attorneys can also recommend therapists and counselors to the husband so that he can go on with life after the divorce. You can find an online directory for lawyers and attorneys. Just make sure that you choose an attorney who specializes in divorce cases. Some attorneys are expert in handling the wives in divorce cases and so you should choose attorneys who handle the men. Don’t forget to check out ADAM and its online site. There you might be able to find a good attorney who will help you out with all the legal matters pertaining to the divorce. Once you’ve chosen a good and reputable attorney, you must discuss all the matters together. Don’t keep anything from the attorney and try to treat him/her as your best friend. Right now, your attorney is the only person you can trust, aside from your family. Again, you must keep in mind that attorneys cost a lot so you should be prepared for it. Filing for divorce is not easy. You have to deal with a lot of legal matters and only your attorney can help you. Find the best divorce attorney in your area now so that the divorce proceedings will not be too difficult for you. It’s also one way of securing your financial future so don’t try to handle all the legal matters on your own. Divorce cases are not as easy as you think; so seek the necessary help. Have you ever been in a situation wherein you need immediate legal help? You can definitely save hundreds or even thousands of money by not hiring any attorney because you can simply access the legal self help services available online. Because of today’s highly advanced technology, people can easily access the internet to gather various information resources including legal help. Numerous activities can be done online and this gives online users a lot of convenience; and not only that, using the internet allows users to save time, money, and energy. If some of your business and personal needs require you to complete certain legal documents and issues, you don’t have to find a lawyer to do such tasks for you because you can already do it on your own. If you try to browse the internet, you will discover that legal self help services are continuously growing. These services also offer downloadable forms for free. Two factors affect the growth of such services. One is because legal self help services are much more affordable and so it is a cheaper option for those who don’t want to hire the expensive services of traditional lawyers. The second reason is because legal self help services are convenient and much quicker. Did you know that at present, about 50% of divorce issues don’t have any legal representation? The legal self help services cover the usual legal matters like copyright fillings, business incorporation, uncontested divorces, trademark applications, living wills, small claims, and others. These legal matters often require the concerned individual to fill out certain forms accurately and afterwards, submit such forms in the proper agency or court. You must be aware though that legal self help services don’t perform attorney services like giving legal advice. You can only download the needed legal documents from the legal self help services online but the company can’t provide any legal advice concerning your situation because if they do so, they will be breaking the law. The companies concentrate mainly in helping concerned individuals in the preparation of certain legal documents. Once you download the needed legal forms, you should fill it with the required information. The online service will check your forms to see if all the information is accurate. All the necessary instructions and steps will be provided by the legal self help services so that you can finish all the legal matters without encountering any problems. You should also verify the documents to ensure accuracy; double checking the legal documents is much more effective so that you will be able to submit the documents in the proper agency on time. You must be aware that preparing and submitting legal documents is a bit risky because you might submit incomplete documents and paperwork which can prolong the legal matter. There are also professional legal reviewers online that can help you in checking all the needed documents so that everything will go smoothly. If you want to save money and your precious time, make sure that you consult only the reputable legal self help services online. If you badly need an attorney, then perhaps it’s time that you get one. However, if you can still handle the situation on your own, the legal services might be of great help. If you think it’s the cheapest and most convenient solution to the legal matters you’re facing, try to avail of the online legal self help services. Lots of individuals lack the needed resources to pay for good lawyers. It’s a good thing that there are certain legal services that offer legal help for those people with limited means. If you live in Philadelphia, PA, you can find several committees that offer pro bono services. Try to find a reputed law firm in your area who has a committee which handles pro bono cases. Oftentimes, these committees have paralegals and lawyers who can help you with your legal problems. If you’re currently dealing with problems in immigration, education, domestic matters, criminal cases, and political issues, financial issues, and consumer grievances, find a pro bono lawyer in PA now. There are some law firms and legal organizations in PA that provide pro bono legal services and there are even times when they offer counseling. Some organizations give donations to pro bono committees to support the needs of underprivileged individuals such as medical and legal assistance. Reports show that in the state of Pennsylvania were over 123,000 traffic accidents that occurred last year. Now this number is just the traffic accidents that were actually reported. This does not include little fender benders and other accidents that happened in Philadelphia and other cities in the state of Pennsylvania that happen each and every day but they are not reported to the police or to the insurance companies. If you have been involved in a car accident or truck accident You know all too well that you can suffer severe injuries from these types of accidents. If you look at the records in the state of Pennsylvania one person is killed in approximately every 7 minutes in the state of Pennsylvania as a result of some type of motor vehicle accident, car crash, truck accident or any type of accident that involves any type of motor vehicle. as a result of these car crash or truck accident injuries you can incur expensive bills such as bills for any type of hospital emergency room care that you might have received, physiotherapy bills and you might have outstanding bills because you are not able to continue working and can't afford to pay for your mortgage or even make your car payments. All of this means that not only are you probably in some type of physical pain but you're also now suffering financial pain and difficulties as well. Sadly depending on which state you live in you are rights as someone that was injured in a car accident I'm not always that straightforward. and in my personal experience I find that most people are confused about what they are entitled to and what their rights are as an accident victim. And because of this I have found that many people do need a lawyer that specializes in car accidents and truck accidents in order to get everything that they are entitled to. Even if you have car insurance often times it is very confusing for the individual to truly understand everything that they are entitled to. So if you have been in a car accident or truck accident I really recommend that you contact a lawyer who specializes in car accidents and truck accidents and discuss your situation with him. Your lawyer can help you with such things as understanding everything that you are entitled to according to your insurance policy good make sure that you are not taking advantage of by the system and that you receive everything that you are entitled to. in the state of Pennsylvania the majority if not almost all insurance policies at this present time allow for an individual to receive medical care and these medical bills will be paid by your auto insurance company. You also may be entitled to a rental car and you might be entitled to several other benefits that you are not aware of. And if you do have a bad injury you may be able to receive some type of financial compensation because of your severe injuries. That the statute of limitations in the state of Pennsylvania and this basically means that you have 2 years to file a lawsuit if you have been in any type of car accident. What this means is that you should definitely speak to a personal injury attorney as quickly as you can after your accident. I have seen all too often that someone was seriously injured in a car accident and for some reason they're waiting until three years later to received some type of financial compensation and to get their medical bills paid but by that time they were beyond the two years time period that people involved in car accidents are able to sue. so if you live in Philadelphia definitely call Philadelphia car accident lawyer so that we can help you with your problems. we specialize in people that has been in car accidents and truck accidents and they have been seriously injured. we understand the complicated laws and also you're complicated insurance policies. we also understand that you are probably suffering physically and mentally - from physical pain and mental and emotional pain. So call us now so that we can help you with your situation. In the state of Pennsylvania the insurance system is a no fault system and that just means that no matter who caused the accident your insurance company has to pay for your injuries. The only problem is that many people do not have enough insurance to cover all Of your expenses and injuries. and that's why in Pennsylvania there are three types of insurance. Insurance type number 1 is personal injury protection. this type of coverage covers all of the expenses from medical treatment 4 you and anyone else on your policy or living in your house. in Pennsylvania the lowest amount of coverage that you can have with your policy is $5,000. Insurance type number 2 is body injury liability. and for this coverage it protects you and covers any type of medical expenses for people that have been injured in an accident that might be considered to be your fault. Normally the amount of coverage in this type of policy is $15 for an individual person or a total of $30,000 her motor vehicle accident, that includes everyone that has sustained an injury. Insurance type number 3 is property damage liability. This type of insurance coverage takes care of the repairs war actually the replacement any type of property that has been damaged in an accident. and in the state of Pennsylvania the least amount of insurance coverage for this is $5,000. One thing to definitely make sure is to know the difference between full tort and limited tort. Now with limited tort you might be able to be compensated for your physical injuries if you have have a serious injury, permanent impairment.. With the limitet option your insurance will definitely pay for all of your medical bills and therapy that you will need. Now with full tort you are able to see 4 all injuries that you have sustained after a car crash. you are able to go for compensation for all of your medical bills and also for your pain and suffering. And there are 2 other options that you need to know about , Uninsured motorist coverage and underinsurance motorist coverage. underinsured motorist coverage if you are injured by someone who doesn't have enough of an insurance policy to take care of your damages and injuries. Uninsured motorist coverage will protect you if your accident was caused by a person who doesn't have any type of car or truck insurance. If you have recently been in a car accident or truck accident you know the pain, the physical pain and emotional stress and suffering that you're going through. Call and let me and my Associates help you and your family. let us work hard to get you and your family everything that you are entitled to. let us make sure that you are getting the appropriate medical care that you not only need but you are entitled to. Let us assist you so that financially you are compensated for the severity of your injuries. For years we have been helping the people of Philadelphia and Bucks County Pennsylvania when they have been involved in a car accident or truck accident. We do our best to alleviate your stress and strain during this difficult time. Call me now will allow me to help you and take care of all of these other things while you focus on yourself and your family.